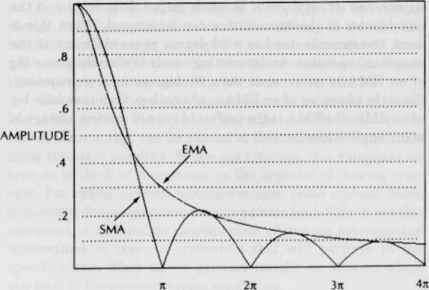 Since the EMA is a kind of moving average, it is also a low-pass filter. A common way to characterize filters is by their impulse response. An impulse is a mathematical function that is infinitely high and has zero width. The height approaches infinity and the width approaches zero in such a way that the area of the conceptual rectangle is unity. Applying the impulse to the input of a filter is similar to striking a bell and listening for it to ring out. The impulse function is zero everywhere in time except at time equal zero. TIME INCREMENTS Figure 4-4 EMA Filter Impulse Response decay of the response to the impulse falls as the exponent of the trial. That is, the EMA has an exponential decay. Now it's easy to see how the exponential moving average got its name. The rate of the decay depends on the K factor. where a is a constant to be found. where W - 2 * Pi * frequency j - imaginary operator, a 90-degree shift H(W)- 1/(1 -f jW/K). This definition is based on the average age of each. Note that this definition is substantially the same as the first definition derived except for the shortest window lengths. Examination of the H(jW) frequency response gives insight into the phase delay of an EMA. Wrhen the frequency is near zero, jW/K is much smaller than unity and can be ignored. In this case the output is almost the same as the input, and there is no phase delay. On the other hand, when the frequency approaches infinity, jW/K is much larger than unity and the unity factor in the denominator can be ignored. When this is done, the denominator has a 90-degree phase shift due to the imaginary operator. 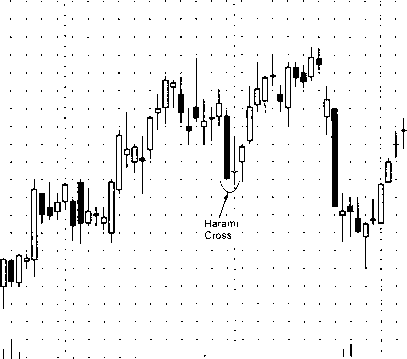 An interesting result is that the phase lag of an EMA is never more than 90 degrees at any frequency. Since the phase lag of an EMA is always less than the phase lag of an SMA, the EMA is the preferred type of moving average in many applications.